Many have wondered about the similarity in name of American critical realism and the movement of the same name begun by Roy Bhaskar. The figure of Maurice Mandelbaum complicates the relationship, not only due to his career bridging the two movements but also Mandelbaum’s concern not only with traditional concerns of American critical realism (epistemology and philosophy of science) but the nature of society, the nature of social explanation, and naturalism. This volume reflects both on Mandelbaum’s own career and the relation of his thought to Bhaskar’s critical realism. By examining Mandelbaum’s commitments to phenomenology within critical realism, as well as his goal to enlighten social scientific and above all historiographical categories, it is possible to see how Mandelbaum went beyond the scientific realism of his predecessors. At the same time, a fruitful comparison with Bhaskar’s and others’ thought is undertaken by examining mandelbaum’s solutions to the problems of the ontology of sociology and social laws, the dynamics of cultural change and the overriding master narratives that govern late capitalism. By explaining Mandelbaum’s scrupulous attempt to address the horrors of the twentieth century, it is possible to appreciate his significance for the twenty-first. 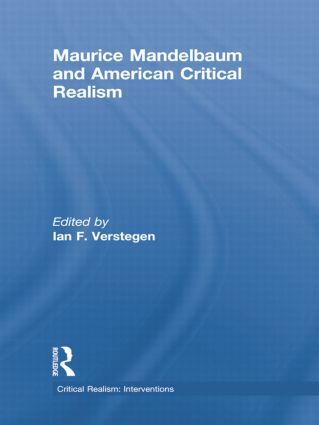 A timely and important book, Maurice Mandelbaum and American Critical Realism is essential reading for all serious students of critical realism and twentieth century philosophy.